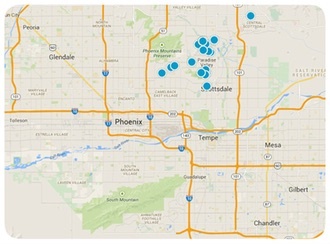 Real estate in Mesa, Arizona is ideal for almost everyone. A suitable location for individuals, families, and the elderly, Mesa is a flexible city which caters to most people's lifestyles. It is another of Phoenix's bedroom communities, and therefore is decidedly residential, but still in close proximity to major cities to which its residents commute for work. Although the population is one of the largest in the state, the city maintains this residential feel. The downtown area is small and relatively quiet, but there is no lack of activities because of it. Mesa is only 15 miles east of downtown Phoenix and is the third largest city in Arizona. Residents love the feel of a suburban community while having the amenities of a thriving metropolis. There is so much to do in this beautiful city including, gorgeous parks, many different sports facilities, top-notch golf courses, community festivals and events, shopping malls, and Mesa’s popular Chicago Cubs Spring Training baseball. You won’t have a hard time finding the perfect home or residential area in Mesa. There is a wide variety of residential style dwellings including, single family homes, large estate homes, condominiums, apartments, and town homes. The median home value is $184,100. The home value rate has risen by 2.9% in the past year and it’s predicted to rise by another 3.6% in the coming year. The median price per square foot is $118. Since the city is one of the most populous in the state, real estate investment opportunities in Mesa, Arizona are ample; there is a wide variety of homes for sale, and as your Mesa real estate agent, we can help you narrow down the options and find your ideal home. Our agents are experts in the Mesa real estate market and have extensive access to listings of homes for sale; knowledge that we will pass along to you as we join you in your search for a new home.